I always enjoy checking out the newest releases on the eshop as I've discovered some fantastic games I've never heard of. Upon one such search, I found Wizard of Legend. Despite its unoriginal name, it looked interesting and so I gave it a shot. Wizard of Legend is what happens when you combine the visuals of Hyper Light Drifter and the gameplay of something like Enter the Gungeon or The Binding of Isaac. While the game at times can be fun, even exhilarating, it lacks a strong sense of staying power unless you commit to unlocking everything this game has to offer. Wizard of Legend plunks your cloaked character down in the middle of a fictional museum of Lanova. While this introduces you to the world and its lore, it also acts as a tutorial and lets you try out various weapons and spells, which are called 'arcana', as well as equip your character in the colored cloak of your choosing. As you wander around the museum, you will learn about the 'chaos trials', a special magical event that is overseen by the Lanovian Council of Magic. Upon completing the tour and trying out the various arcana at your disposal, a mysterious relic calls out to you and transports you to the Lanova plaza and you are invited to take part in the real chaos trials. Each expedition into the chaos trials sees you enter procedurally generated environments that match the element of the three Wizards of Legend; Earth, Flame, and Frost. While the combat and enemy variety can shake up how each environment can play out, these locations are merely pallet swaps of one another and lack the charm and appeal of a handcrafted design. Each location ends when you discover the portal that leads to the next area. Each portal is defended by a sub-boss that tends to mimic the more basic powers. These foes are trivial encounters and usually don't offer up much challenge at first. The actual Wizard bosses, however; are no joke and make the sub-boss battles look as simple as smashing an unsuspecting barrel. As you enter each area, the map will dictate how much of it you have discovered and exploring each location to its fullest is ideal as you won't want to leave any gold or health orbs behind. You'll encounter various shops to buy new arcana, relics, and outfits and every bit of gold you can discover will help you in your efforts to learn new abilities, or just look your fashionable best. As with most Rogue-like games, you'll want to ensure that you have everything you need as a single death can reset your entire progress. The shops you find in each of the trials offer up a trial of that arcana, meaning that should you die, you lose that particular spell. Any arcana you buy in the plaza is yours to keep forever. When you defeat a Wizard of Legend, they will drop an arcana and that one is yours to keep as well. The key to survival in the chaos trials will solely rest on your combination and effective use of both your arcana spells as well as the relics that you equip. While it can take dozens and dozens of hours to find the combinations that are right for you, it can make or break your ability to fly through each of the Wizards and the final challenge that awaits you. Arcana spells will vary from equipping a fire shield that will track down nearby targets, a frost spell that hurls razor-sharp ice shards or summoning a dragon formed out of the wind. The 128 arcana spells will vary from close range combat to far-reaching range attacks, so mixing and matching these will assist in not only your ability to lay the smackdown, but also that of your survival. As relics as just as important as the arcana spells you wield, the 178 different relics will assist in granting you advantages over your foes and make you faster, stronger, better. Relics allow you to deal more damage, evade a tad bit quicker, summon an aura that will damage nearby foes, apply discounts at the various shops and much, much more. Having the right relics equipped alongside your arcana spells is the most important aspect of this game and one that can take dozens of hours to fine tune. With such a variety of arcana and relics to choose from, you may want to research certain builds or find out what each item does before you buy it as the item's use can only be identified after you've bought it. As you mix and match your spells and relics, this can fundamentally change your playstyle and can really have a huge impact on the enjoyment you have with the game. While you want to find the right combination to destroy the various enemies that flood each map, you want a mixture that is effective against the bosses as well. Having a setup that is only close range can be your doom if the encounter calls for range attacks, so finding that balance is crucial. While you can purchase and collect various arcana, you have to maintain a certain collection of them during your adventures. You'll require a basic attack, a standard attack, a signature move, and a dash to allow you to traverse gaps in each environment. Each of these slots can only be filled by one arcana at a time and can only be changed at the shops in the dungeon, or freely in the plaza before each excursion. When you visit the plaza before a round, you will use crystals that you earn as you explore each location to purchase what you need. While you can purchase temporary arcana abilities while in the trials, you will spend the gold you collect to do so. The crystals that you earn in each round are permanent and stick with you even upon death. The combat featured here is fast, fluid, and precise, making any mistakes in your trials that of your own lack of skill. At first, I struggled to even take down one of the main bosses, until I started to come to grips with certain combinations and how effective I could be by utilizing my dash in certain ways, complimenting the arcana I chose to take with me. Taking down my first boss was a monumental achievement, and one that would be short lived as I survived the encounter with a sliver of health. If you've played Hyper Light Drifter or Phantom Trigger, then you'll know exactly how important fast-paced combat and responsive controls can be in a game that is designed to be difficult. Rogue-like games are not usually my thing, but I have a soft spot for pixel hack and slash games and while it took a few hours, it started to really get its hooks into me. Wizard of Legend, despite it's rapid and fluid gameplay which seems solid for a single player game, has included multiplayer as well. This single screen experience is where the vast amount of enjoyment will be had. While the game is frantic and it can be somewhat difficult to see everything that is going on when special attacks are flying all over the screen, there is something insanely satisfying about the co-op mode here that you don't quite get in single player. Teaming up special attacks is one thing, but there are also relics that will benefit the additional player being with you. What is even more impressive about the co-op nature of the game is that you can resurrect your teammate by killing enemies and creating life orbs that their ghost form can collect should they fall in battle, a function not possible in single player. I've briefly talked up the visual style of the game and you can clearly see in the pictures I've provided exactly what you are getting. The game is fluid, controls are instantly responsive and overall the title is very easy to pick up and play. I do wish that the levels themselves were more than just pallet swaps and that the elements were more present in a way that gave each location some personality. The background music and sound effects are ok and service the game in ways you would expect. The main attraction to a game like Wizard of Legend is in the mixing and matching of arcana and your relics. This can lead to hours upon hours of experimentation and just finding exactly what works for you. The level design is really the only lacking aspect of what Wizard of Legend offers here as the environments feel exactly same regardless of their theme. Wizard of Legend is the type of game that you get what you put into it, so if grinding away to find the best arcana and relics is not satisfying enough for you, then It may be hard to recommend the title to you. 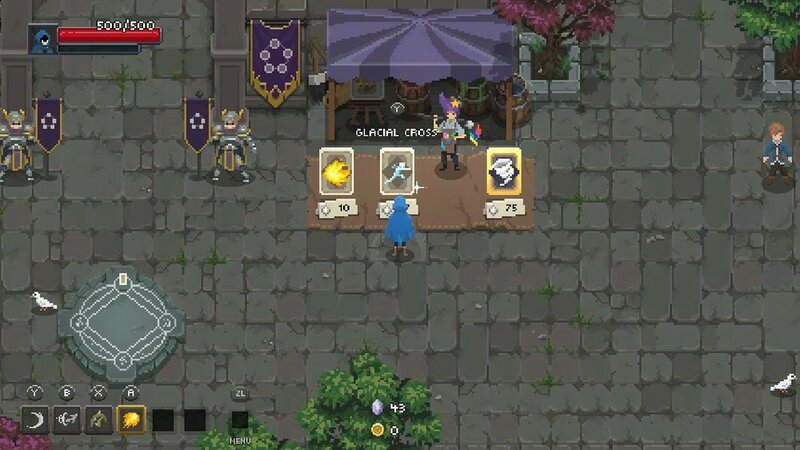 If, on the other hand, that sounds very appealing, then Wizard of Legend can be a very rewarding experience and a steep challenge awaiting those who want it. wizard of legend WAS PURCHASED BY THE REVIEWER.